Oregon Shooting: 'This is Becoming the Norm.' But Will Anything Change? Tuesday’s shooting in Portland, Oregon was the second mass shooting in a week. President Obama fears “this is becoming the norm.” If one of the most powerful men in the world feels powerless when it comes to gun legislation, then where do we go from here? Join the discussion on our Facebook page. The scenes are becoming depressingly familiar. A gunman opens fire on an American campus. Students, teachers and administrators duck for cover. Parents anxiously wait for their kids to check in, praying for the phone to ring. It played out again Tuesday at Reynolds High School in Troutdale, Oregon, a city of 16,400 people about 12 miles east of Portland. A student at the school shot and killed another student before apparently taking his own life. The victim was a 14-year-old freshman Emilio Hoffman. Police haven't yet disclosed the shooter's identity – or, more importantly, what compelled him to carry out such a horrifying act. The shooting, the second in a week's time, is the latest in a long string. An attack at Seattle Pacific University last week killed one person and wounded two others. Since the December 2012 shooting at Sandy Hook Elementary School in Newtown, Connecticut, there have been at least 74 school shootings, according to the advocacy group Everytown for Gun Safety. That's nearly one a week in the last 18 months. Speaking in Washington, President Barack Obama said the nation should be ashamed of its inability to get tougher gun restrictions through Congress in the aftermath of mass shootings that he said have become commonplace in America. 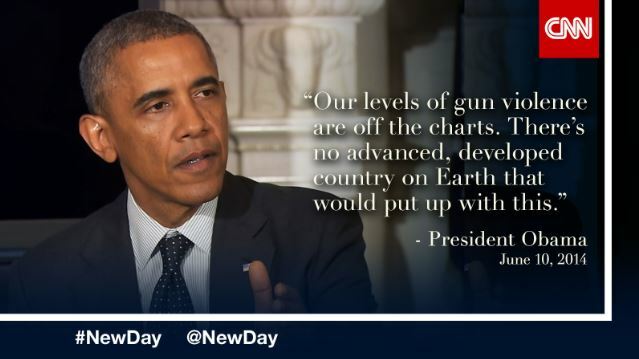 "Our levels of gun violence are off the charts. There's no advanced, developed country on Earth that would put up with this," he said. I guess he wasn't around in the '90s. Where are those who think America could save Nigeria from it's predicament. Obama says shooting has become s norm in America, as it occurred in Portland, Oregon. Where do we go from here? Help one another to resolve the violence, and always ask GOD to take the lead in a battle against crimes. World's been like this since the oldest times & peoples fighting will against will, ever since the world begun. you love violence over all other things, it constitutes your country. You love it more than you love freedom, family or God. it's not the guns fault, its your culture. The question is..Where do we go from here? We go to early intervention for our children.We provide mental health screenings by a liscened psychiatrist at every school and provide services to those identified. We help our children early on rather than warehousing our mentally ill in prisons after they have ruined multiple lives.